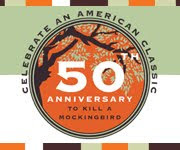 Booking Mama: Happy Anniversary to To Kill A Mockingbird! Today is the 50th anniversary of TO KILL A MOCKINGBIRD by Harper Lee! TO KILL A MOCKINGBIRD just happens to be my all-time favorite book and I wanted to share a little bit about how much this book means to me. I first read TO KILL A MOCKINGBIRD back in high school and I immediately fell in love with not only this wonderful story, but also the characters of Scout and Atticus. It was the first time that I remember a book actually taking my breath away -- I just couldn't get enough of this story. (I actually read it three times in a row!) I loved Ms. Lee's writing style and storytelling abilities; however, I also appreciated many of the topics that were explored in this novel, especially the parts about racism and prejudice. As part of my English class, we also watched the movie version of the story. I almost never think a movie is as good as the book, but this one is pretty darn close. While I did like Atticus in the book version, I absolutely fell in love with him (and Gregory Peck) in the movie version. I could go on and on about all of the positive traits of Atticus Finch, but I'll just say this -- I consider Atticus to be the ideal man (and father.) No other fictional man even come close to Atticus in my mind! If you are like me and just adore this book, then you might want to join in the celebration that's going on all month long! Harper Collins has set up an incredible website devoted to the book. You can see all of the celebration events going around across the country as well as special pages devoted to teachers and book clubs. You can also enter a sweepstakes to win a TO KILL A MOCKINGBIRD prize pack. In addition, there is a fan page on Facebook. I hope you will join me (and plenty of other readers) who are going to read TO KILL A MOCKINGBIRD this month! I'd love to hear what you think about this most-amazing book! You won't believe this, but I didn't read To Kill a Mockingbird until after I was married and saw the movie. Wouldn't it be fun to go to Monroeville for the festivities this year? I re-read the book each January with my 9th graders, and look forward to the experience each and every year. I am hopeful to listen to the audio book, as narrated by Sissy Spacek, this month in celebration of this momentous occasion. My mother read us the book the year it was published or very soon thereafter. It was not assigned in school, but I have read it a number of times and have seen the movie a number of times too. I'm starting to sound like a broken record and am beginning to annoy myself, but the audio is worth a listen. It is hard to imagine that the experience of reading the book could be improved, but with Sissy narrating as Scout, it can. Highly recommended! My mom and I are planning on watching the movie soon! To Kill A Mockingbird is an all time favorite for me as well, I re-read with my kids when they were assigned the book for class. I'll miss it when my last one finishes it. I guess I'm going to have to break down and buy my own copy! LOL! Somehow I never had to read this in high school or college and sadly I still haven't read it. But, since it is the anniversary, I plan to read it while we drive across the country for our vacation. I have also encourage our book club to read it in August since I know there are some in our club who haven't read it either. I am excited to read it in a couple weeks! I just finished reading and listening to TKaM. I haven't written a review yet. I am so glad that I finally read it. Scout is just the most adorable little tomboy there ever was. I kept wondering about them calling their dad by his first name. I know some families are like that though. Did I miss something &mdash: as to why they did that? Many of the scenes described and conversations reminded me of my childhood. Sissy Spacek as Scout is phenomenal. She was great at the complete narration. I've got to read it again. I loved this post of yours, Julie! Is there a group read of "To Kill a Mockinbird" this month? I would love to join it. I think it is one of the best books around. There is so much about it to appreciate from the characters to the writing style to the story itself. I absolutely agree with you that Atticus is the ideal man. I really liked the scenes in the movie when Atticus is sitting and talking with Scout. Makes my heart melt. Gregory Peck was amazingly well cast, too and the movie is quite good. I always prefer the book just because I prefer books but the people who worked on the movie did a wonderful job. I'm hoping my husband will join me (and others!) for the viewalong on 7/30 ... will you be watching then?